Our church building is located on the northbound side of U.S. Highway 202 at Charlotte Drive West, next door to Cafe Emilia (a restaurant formerly known as either "The Wild Mushroom" or "The Alcove"). It is in the section of Bridgewater closest to the Borough of Raritan, south of the intersections of Highways 22, 28, 202, and 206 in Somerville. From Flemington and points south: The church building is at the first street after Milltown Road (not counting the right-hand turn into ThermoFisher Scientific or the left-hand turn into the Bridgewater Towne Centre). 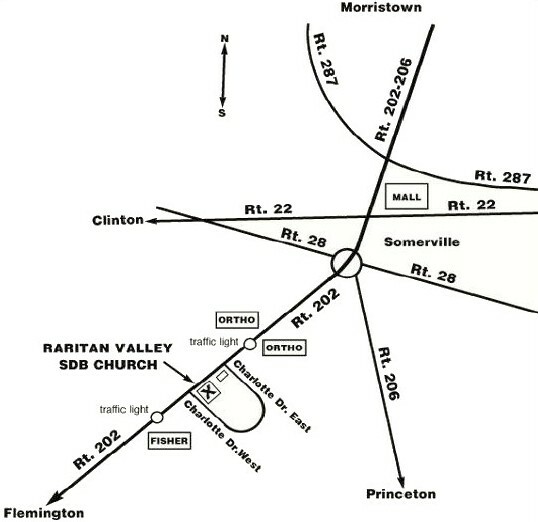 From Somerville and points north: Since this is a divided stretch of highway, it will be necessary to travel on U.S. Highway 202 south (past the Ortho plants) and to make a U-turn from the specially-designed left-hand lane (with a traffic light) at ThermoFisher Scientific, just prior to reaching Milltown Road. (The Bridgewater Towne Centre [with Wegmans, Home Depot, and Ruby Tuesday] is at the far right.) After the U-turn, proceed to the next right-hand turn onto Charlotte Drive West. The entrance to the church's parking lot is on Charlotte Drive. is sometimes misread as 202-206, northeast of our actual location.